Today’s AM fix was USD 1,287.25, EUR 935.09 and GBP 775.13 per ounce. Yesterday’s AM fix was USD 1,284.00, EUR 930.91 and GBP 771.26 per ounce. Gold climbed $9.50 or 0.74% yesterday to $1,290.00/oz. Silver rose $0.15 or 0.76% yesterday to $19.96/oz. Gold added to sharp overnight gains today due to physical demand. Traders appear to be squaring positions before the release of U.S. nonfarm payrolls data. With the U.S. economic recovery faltering of late, a worse than expected number could lead to safe haven buying. The ECB is unlikely to further reduce interest rates today. Despite risks that the eurozone is falling into recession and the more dovish tone adopted recently by some policy makers, only a few analysts expect the ECB to adopt an even looser monetary policy at its monthly interest rate policy meeting today. Indian gold imports likely jumped in March from the previous month after the central bank allowed more private banks to import gold bullion, the head of the country’s biggest jewellery trade body said. 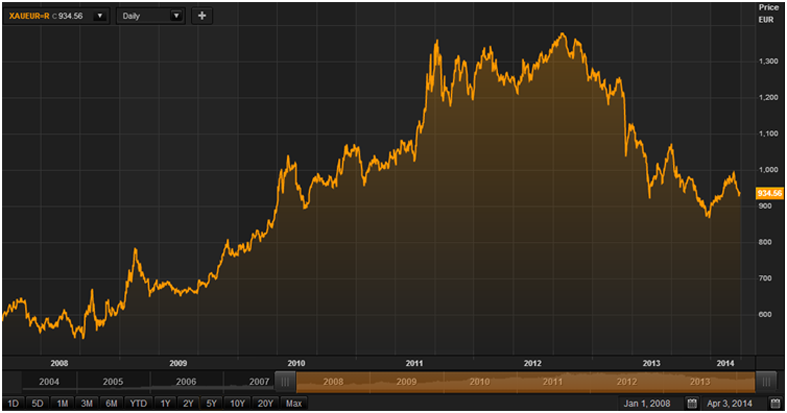 In 2013, India’s government restricted gold imports to cut a current account deficit. Reserve Bank of India Governor, Raghuram Rajan, said today that curbs will be removed gradually. The risk that creditors, savers and bondholders, rather than taxpayers will bear the brunt of rescuing a bank in trouble form part of the first credit ratings given to 18 of Europe’s biggest banks yesterday by new ratings agency, Scope. Scope said its ratings reflected the likelihood that if a bank runs into trouble, bondholders will be “bailed in” to strengthen the bank rather than a taxpayer-funded rescue as happened during the financial crisis, according to Reuters. The company, which set up in Berlin in 2002 and started credit ratings two years ago, said it aims to offer a new approach for corporate bond investors that typically rely on the three major ratings firms – Moody’s Investors Service, Standard & Poor’s and Fitch Ratings. Scope focused on the risk posed to bank bondholders rather than the very real risk posed to bank’s other creditors – the depositors. “Banks are still too big to fail, the only difference is that somebody else will pay to avoid a failure, and that somebody else is the creditors,” said Sam Theodore, Scope’s Managing Director for Financial institutions. “Through bail-in you could call this the privatisation of bank rescues, which to us is one of the most significant regulatory steps taken in recent years in respect to banks,” Theodore said. A new resolution and recovery regime for banks is in place in Switzerland and is coming in across the European Union, the UK and G20 nations. The measures mean that large banks will remain “too big to fail” and that rather than taxpayers being on the hook for the poor performance of banks, now hitherto protected depositors, including the deposits of employment creating companies, will be used to bail-out “too big to fail” banks. Banks globally remain vulnerable. Our recent research on the developing bail-in regimes clearly shows this. It is now the case that in the event of a bank getting into difficulty, deposits could be confiscated as happened in Cyprus. 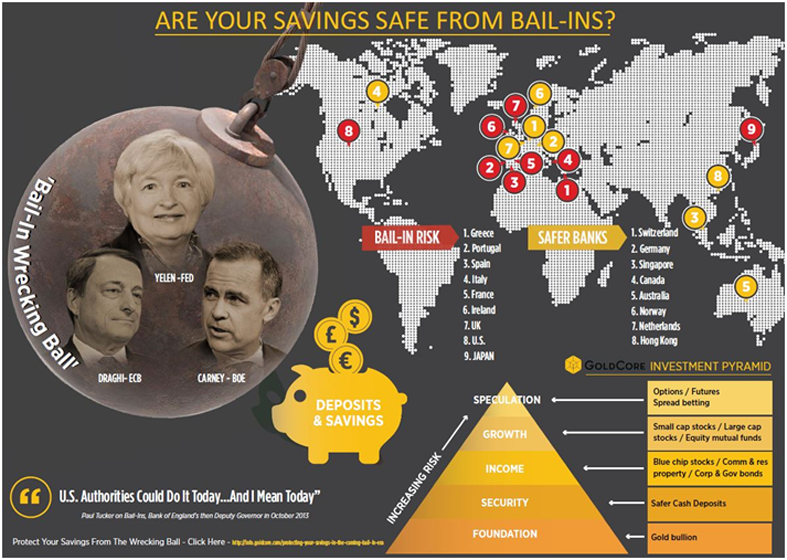 It is important to realise that not just the EU, but also the UK, the U.S., Canada, Australia, New Zealand and most G20 nations have plans for bail-ins in the event that banks and other large financial institutions get into difficulty. The coming bail-ins pose real risks to investors and of course depositors – both household and corporate. Return of capital, rather than return on capital is now of paramount importance. It is important that one owns physical coins and bars, legally in your name, outside the banking system. Paper or electronic forms of gold investment should be avoided as they, along with cash deposits, could be subject to bail-ins. Dr Faber’s webinar takes place this Friday, April 4th, 2014, at 0900 BST (0900 British Standard Time or London and UK time). Register today to attend the event or to receive a recording of the webinar.